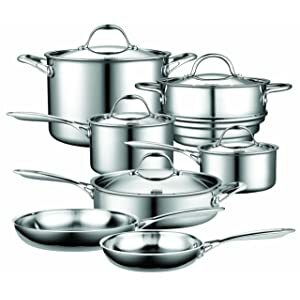 My mother owns the Cooks Standard NC-00232 12-Piece Multi-Ply Clad Stainless-Steel Cookware Set, and if I compare it with all the cookware sets that I have and have had in the past, I realize that the set has some unique and exceptional features. The feature set of this product makes it stand out in the market and maintain its position as one of the best cookware sets presently available. This is one of the primary reasons why I decided to write a review of this product. The construction is sturdy and robust. You can expect it to last a long time before you will have to find a replacement for it. The quality of the product is truly exceptional. Besides this, there are several things about these cookware items are sure to leave you flabbergasted. The Cooks Standard NC-00232 12-Piece Multi-Ply Clad Stainless-Steel Cookware Set is manufactured in China. If that has gotten you thinking, please don’t worry. The product does not compromise on quality or performance in any way. As it is making region based generalizations is not just unfair, but also unwarranted. The product is a perfect combination of good quality and great price. The set also includes lids. The lid provided for the 8-quart stock pot fits perfectly on the 10-inch skillet. Besides, the lid provided for 3-quart sauce pan can also be used for the 8-inch skillet. This product is undoubtedly the most inexpensive cookware set that uses tri-ply technology. This is one feature of the product that makes it worth every penny spent. You cannot find a cookware set using this technology at a price lower than this. Besides, the cookware set is capable of working equally well on different kinds on cook tops. Therefore, the next time you wish to use it on your induction cook top, go ahead! The product is very well made, and you can look at the feature set and say that they have actually paid great attention to the minutest of details. The design, construction and technology used, are a reflection of the fact that they have put your convenience on top of everything else. The handles used in this cookware set make use of ergonomic material making them extremely easy and comfortable to use. In addition to this, the rim of all these pots is flared, which ensures that you can pour without dripping. The look and finish of the product are impeccable. The interiors have a brushed/matte finish and the handles are constructed in the air-flow design. If you see a picture of one of these, you may actually feel that the photographed has been edited, but that is certainly not the case. The rivets are made from stainless steel material from the inner side. However, some designs may also have aluminum rivets. The product is the best, when it comes to performance. This can be attributed to the fact that the material used for the construction of the cookware is stainless steel. This automatically adds features like durability, good looks and easy usage to the benefits list. Besides this, the non-stick function of the cookware item works better than that of the best of Teflon pans. This makes it a healthier alternative to Teflon pans. My mom does not have the patience to wash dishes with hand, and this is where this cookware set is bliss. You can simply wash it in the dishwasher without worrying about any kinds of harm to the item. In case of tough stains, a barkeeper’s friend can be used. I can assure you that it shall not require a lot of muscular effort to get that stain out. This product is very popular, and I was amazed at the number of online reviewsand comments about the product that are already available online. Every person has a different way of using a product, and it is always good to take opinions of different people before forming an opinion. Online shopping has paved way for a very convenient and easy shopping experience within the comforts of your home. This experience is all the more pleasurable when you get additional discounts and offers on products. As a result, you can get the same product at a much lower price, without having to put in any kind of effort. The same is true for this product. Amazon has some amazing offers and discounts on offer. You may also be able to available the free shipping facility if you order the product now. For more details, you can visit the following webpage – click here to learn more! The critical person that my mom is nothing less than outstanding impresses her. But, she continually raves about the looks and performance of her set all the time. So, I have no reason to doubt the capabilities of this product. The handles remain cool enough to hold without causing any discomfort. The balance of the lid and pot combination is perfect, and you do not have to worry about holding it in your hand. The pouring surface of the pot has a folded lip. Therefore, you can easily pour things from the pot. In addition to this, these cookware items look amazing and are sure to add aesthetic value to the décor of your kitchen. I highly recommend this product. It is a total value for money. Click here to buy this cookware set!